Contact us to book your free design appointment. We have flexible appointments available to suit you. Marquis is an affordable sliding door range, available in a wide range of colours and wood effect finishes. Choose your colour and finish. We have a wide range of colours and glass colours to choose from. Select the colour of the steel framework that goes around the outside of the doors. Select the colour and design of your carcase and interior. Interiors are totally made to measure, giving you all the storage you need. Choose from drawers, hanging rails, shelves, shoe storage, tie and belt racks, and internal dressing mirrors. Available with coloured glass, mirrors, and multiglazed with mirrors, vertical panels and horizontal panels. Fill in the form and we will call you back to discuss your requirements. Want to transform a whole room? 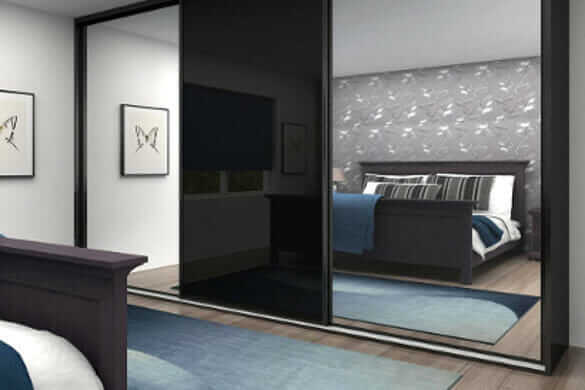 We offer fitted bedrooms and bespoke furniture options within our Marquis range. And we make all our furniture on site in our own West Wickham workshop, so everything can be completely customised to meet your needs. Get in touch with The Complete Wardrobe Centre to book in your free, no obligation appointment.